I just can’t help looking at Sower’s $17.44 price tag as a rare (from the pre-mythic era, yes) versus Silumgar’s $7 price point right now. Again, I’m advocating keeping a close eye here, as if this sees no Standard play (and I don’t expect it to see much, if any) it should drop sharply and present real opportunities. It’s not like I said Silumgar was horrible in Standard and would surely be a bulk mythic, but I assumed that, like most six-drops, it wouldn’t be good enough. Considering I don’t play or watch much Standard at all, I was basing my belief that the card wouldn’t see a lot of Standard play mostly on Eric Froehlich’s analysis of the card on Constructed Resources. He wasn’t too wowed by Silumgar, and I took his evaluation at face value. Frankly, I don’t feel too bad about missing here. I didn’t have strong reasons to believe the card would see play in Standard, so I didn’t buy in. From my perspective, it’s always better to not buy in and have a card go up than to buy in and have the card go nowhere. Sure, I might miss a few profit opportunities here and there, but I would rather save my limited MTG money for specs I feel very strongly about. Remember, my goal with MTG finance is to spend as little time on it as possible, so buying only to flip at about the same price is highly unattractive to me. 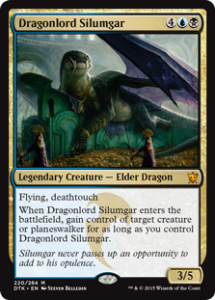 If you’re looking to play Silumgar in Standard, the traditional summer lull in prices should be a good time to grab copies if you don’t need them for upcoming tournaments. As for Commander and Cube, I’m pretty comfortable waiting for rotation, but if the card drops as low as $5 during Standard, I’ll snag a copy then. The lesson for me here is that no matter how good the player, no matter how reasonable-sounding the analysis, no matter how sure you or someone you trust is that a card is or isn’t good: there’s no way to know for sure rather than seeing it played in games of the appropriate format. Of course, recognizing when the community at large has misevaluated a card is the best way to profit—it’s just so hard to go against the hive mind. Don’t you wish you could have gotten into Magic earlier? I mean, all those early sets were just packed with value—all you had to do was be there. Well, I am not The Doctor, so I am not here to take you back to that magical time in the mid-’90s. But what I can do, right here, today, is point you toward something I’ve discovered in the last couple weeks that may or may not be of interest to you (and if it’s not, never fear—we’ll be back to more traditional Magic finance content next week). 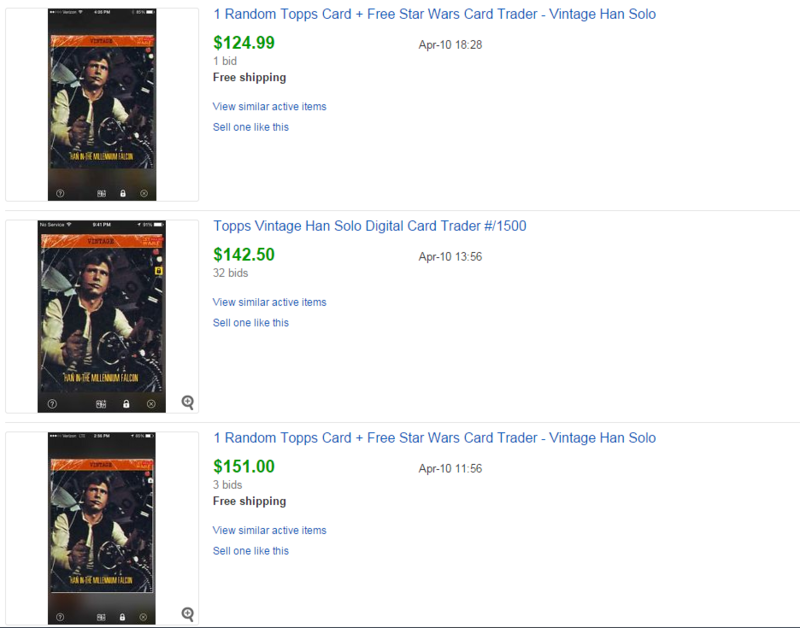 In early March, a new app was released, currently only for iOS products but coming soon to Android, called Topps Star Wars Card Trader. I’ll give you one guess as to what the product is. You’re reading this site, which presumably means you’re a Magic player, which presumably means you like to open packs of cards. Being in the exact same boat, I was easily convinced to give it a casual try. But there’s no way these cards are actually worth anything, right? They’re digital collectible cards that don’t have an associated game, so obviously they’re just for fun. 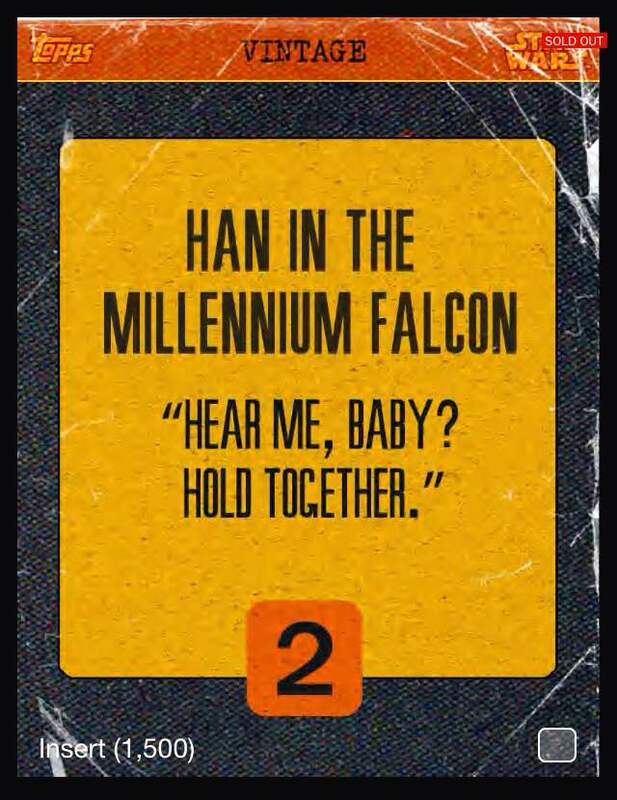 So, what we’re seeing here is the Black Lotus of Topps Star Wars Card Trader: “Vintage Han.” This is the most sought after card in the game (can we even call this a game? ), and even though the app only debuted a month ago, it’s already selling in the $150 range and occasionally over $200. Do I believe that in 20 years this will hit the numbers that Black Lotus has hit recently? Absolutely not. But it’s pretty clear there’s money to be made with this app. Here’s a quick breakdown of what you need to know for those of you who are interested. If not, skip this section to get back to why an app like this matters for MTG. For the release period, Topps is giving out 25,000 credits for each day you log in, and if you log in seven days in a row, you get a bonus of 50,000 credits. These numbers will be reduced at some point, but this is the current system. Most of the cards you’ll open in this app are from the base set. Each card has five rarities. From least rare to most, they go: white, blue, red, yellow, and gold. You can always find someone willing to give you nine of a lower tier for one of the next tier up, so completing your base sets is really pretty easy given enough time. The money is in inserts. Understanding how inserts work is key to getting the best cards in this app. From what I have deduced, there are two types of inserts: the first are inserts for a particular subset of cards, such as Hoth, Rebels, and Elite Soldiers. Each of these sets has a specific number of cards to collect, and if you collect all the cards in a certain category by a certain date, you get an award card. The problem is that after the award cards are given out, these inserts lose a ton of value. It’s very common to see traders asking for inserts but specifying, “No Hoth,” which has already had its award date pass. I suspect that as Rebels, Elite Soldiers, and other sets pass their award dates, a similar devaluing will happen. At first people were calling it “Vintage garbage.” Not exactly an inspiring name. Now it’s known as “Vintage steel,” which sounds so much stronger. These aren’t fetcching quite Vintage-level prices, but they’re working their way up. A new Widevision card is released every Saturday. Like the Vintage cards, more are being produced every week, so the sooner you join, the better chance you’ll have to pick up the early cards that will be worth the most. So, if you’re looking to spend a little time on this app in the hopes of making money, you should log in every single day to get your free credits, then be on the lookout for the release of the Vintage and Widevision cards each Thursday and Saturday. That bare minimum can potentially earn you a few bucks a week, assuming you’re lucky enough to open the good cards. Now, how do you get these inserts? 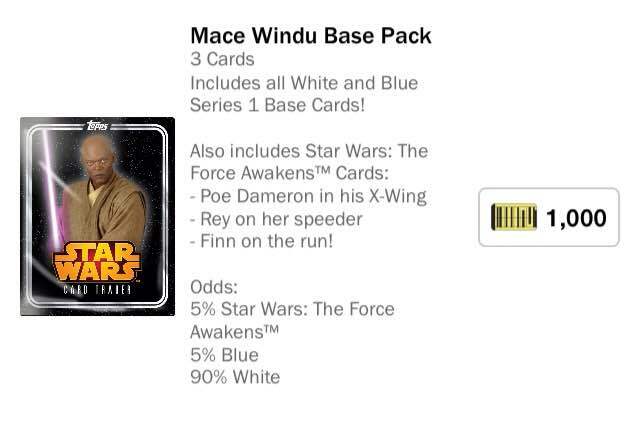 Basically, at the pre-announced time, they can be found in any packs sold on the app. Odds are also given for each card released, and tend to change regularly (inserts tend to be between 1:20 and 1:80 from what I’ve seen so far). 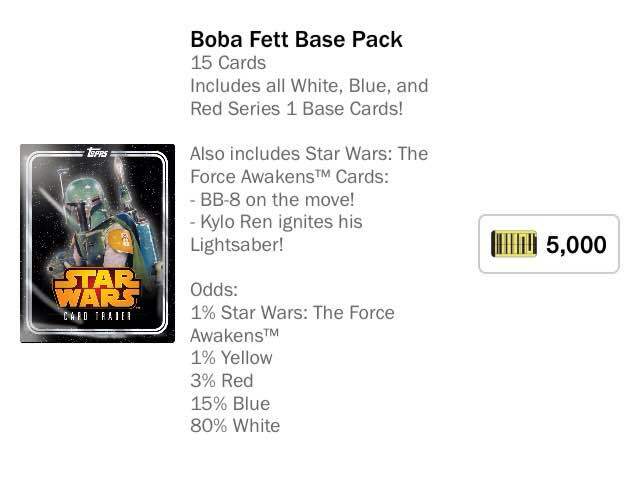 When I first started using the app, the obvious choice to me was to always buy Boba Fett packs. 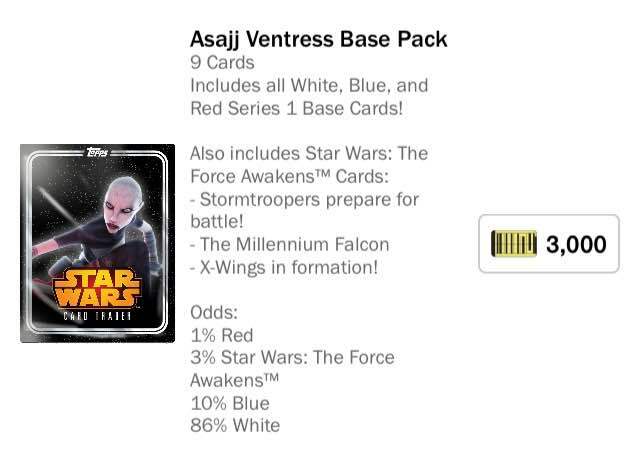 Based on the number of cards in the pack being the same per 1,000 credits spent but offering the only chance at yellow-rarity cards (you have to pay Earth-legal currency or trade for access to gold cards), this seemed like the only way to go. Then I learned something very important: insert odds are based on opening the insert per pack, not an insert being a particular card within a pack. 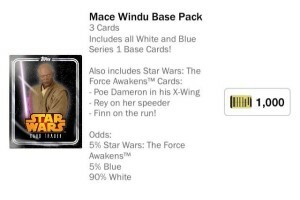 This means that if you’re chasing inserts, you want to buy the Mace Windu packs, because they’re cheapest and will give you the most opportunities to open the card you’re chasing. This is a really basic breakdown, but I certainly wish I had this information when I first downloaded the app a couple weeks ago. 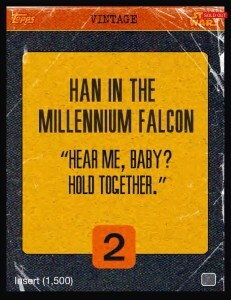 I personally missed the boat on Vintage Han, and each subsequent card has had a higher print run, so it’s unlikely we’ll see any with values that high. 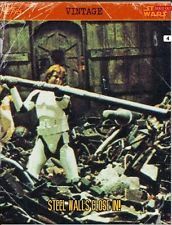 Still, Star Wars fans love their toys, and this one seems to have been adopted pretty quickly. 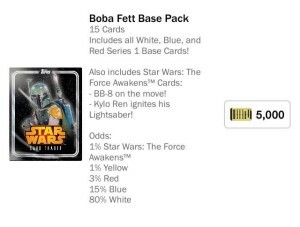 What blows my mind here is that these cards are selling for real-life amounts of money despite having no gameplay value whatsoever. This got me thinking: what if Magic did something similar? Given that it’s clear that digital card collecting in its own right is something some segment of the population clearly enjoys doing, imagine if Wizards of the Coast created a Magic trading app. I can see it now: sign in every day to get three free commons and an uncommon. Sign in every day during a week and get a free booster pack! Include trade functionality within the app, offer free stuff and special exclusive awards to encourage collecting, and give opportunities to get the best stuff for free (with commitment), and you’ll have people who don’t even play Magic collecting cards. Now, here’s where it all comes together: connect this app with MTGO, so that any cards one opens or trades here are synchronized with one’s MTGO account. I think there’s a really good chance that once non-players collect a high amount of cards, they’ll want to find out how to play. How many people do you know that collected Magic for a long time before actually learning the game? I certainly know several. 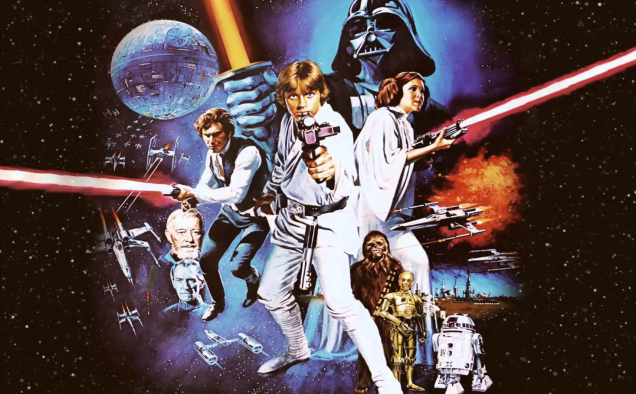 Here’s the thing about Topps Star Wars Card Trader: there is no way in any possible version of history that I would give something like this any attention whatsoever except for the fact that it’s on my phone. I have a lot of demands on my time, and try to not to waste too much of it on frivolous nonsense. The exception is that sometimes you have to wait in line somewhere, or have to commute to and from work, or spend countless hours waiting for your kid’s baseball practices or doctor’s appointments or orchestra rehearsals, or whatever. In these instances, having something to do is crucial. As a result, I’m much less discriminatory about time-wasters on my phone than on my laptop, for example. If I have to kill time, I might as well be doing something reasonably enjoyable that might earn me a little money, right? If people were trying to decide between MTGO and Hearthstone, it’s pretty clear which way they’ll be leaning now. Look, we’re probably not going to get a mobile version of MTGO any time soon, if ever. Realistically, a collection management app with trading capabilities that links to MTGO seems nearly as unlikely, but it’s at least a little more within the realm of possible. It just seems like such a misplay for there to be no quick, easy, and official way to engage with Magic on mobile devices, given the trends in technology and popular culture. Such an app would also help fix the common complaint about player-to-player trading being virtually non-existent on Magic Online. I’d use it all the time. Wouldn’t you? I play hearthstone because I refuse to invest in both paper and online magic, and I can be competitive while playing off previous success and only a small initial investment. I may have only bought 50-100 packs total, and with various arena (draft) winnings and reasonable pulls.. I can make any deck in the game and play at top level. I can now play in the office, on an airplane, in a different city.. anywhere. I like game matches, and tournament swiss.. but it really does take a lot of time to play in any decent tournament. However, there is not a damn thing in this world that will prevent me from hitting GP TO in May. Hell I’ll probably be playing hearthstone between rounds while people take 30 minutes extra time (at least thats how it felt every round the last GP TO). If Wizards put some effort into MTGO, and put out an app? I’d probably sell most of my paper cards and buy into MTGO. At this rate, the nail might be in the coffin. They put so much effort into that planeswalker garbage, why cant they update MTGO to be similar? If im not mistaken, the planeswalker game is on consoles and tablets as well as pc… I played like 5 drafts off initial mtgo register gift and I never played again, It felt like I was playing cockatrice. They have card value in a digital game. update the graphics and gameplay and im 100% on board. my only current reason I am still interested in MTGO is the ability to PTQ online, as well as being able to instantly liquidate cards. Also redemptions area a pretty neat feature. Until Wizards puts some effort into MTGO, I will stick with the simplicity of online mobile gaming in hearthstone. However, nothing will change paper magic.. It’s too good. I want my name to be Vintage Steel. I got in to Hearthstone back when it was in beta, mostly because I don’t have a lot of people around to play Magic with. I would almost certainly switch if MTG put together a mobile version, but I also doubt that that will ever happen. Interesting for sure. Great points made. Couldn’t find this on the play store – only on iPhone or did I miss something? First one by Blizzard and it was good to go. Should be available on both IPhone and Android.. Actually the night it came out My wife and I were in bed dueling eachother before sleep. Her on her Iphone 6 and mine on the Note 4. Thank god I dont have to uninstall, re-download and modify a tablet version every single patch anymore. 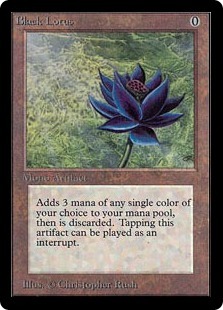 I would be stoked if Planeswalkers translated into a MTGO 2 or something similar. I love Magic, it’s just hard to play sometimes.